The Management Academy is a progressive development programme enabling managers of all levels from any background to enhance their people management performance. This programme is available as an in-house provision where we design and deliver YOUR Management Academy focusing on management areas that are specific to your organisation right now and for the foreseeable future. 80% of the UK workforce stated they have left their manager, NOT their organisation. Staggering isn’t it? To think of all that waste of talent and experience due to poor management. In our extensive experience working inside organisations providing in-house Management Academies managers get promoted to their role because of their ‘Technical’ expertise, their longevity of service, because they started the business or are related to someone who did and they have never had any structured management development to assist them in their role. They either attended a one hit wonder which we know doesn’t work or they picked it up as they went along. With this second options comes the trail of carnage along their journey caused by their Trial and Error approach. How did you become good at what you do in your job? Training, learning, development and possibly assessments and even qualifications? The same therefore is true to become a better manager. Why do we think we’ll just pick it up as we go along? This is possible but the price is far higher than any development programme or intervention you’ll invest in. 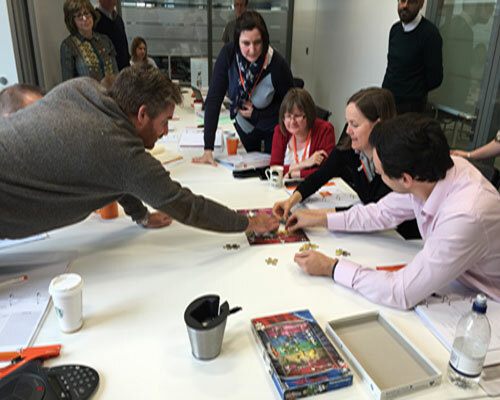 The Management Academy offers managers and potential managers the essential skills, tools, experience and pragmatism to get the very best from their people and deliver the results your organisation wants. Whether you’re new to managing, a seasoned manager wanting new ideas or a senior manager wanting to refresh your skills, an in-house bespoke Management Academy offers you the most up to date solutions you need to be the best manager you can be. The in-house bespoke Management Academy is designed and delivered however your organisation desires. Whether this is as simple as 2 half day modules through to an 18 month rolling programme across all regions of your organisation, we design the modular subject matter and align the delivery method to suit you and your availability. Some clients prefer half days, others full days, others bite size and certain days of the week, and weeks of the month and months of the year are not the best to deliver such learning and development. We adapt to you. We start by understanding the results you wish to see during and after the agreed intervention. Then we work on the subject matter. For example for some organisations ‘Recruitment’ is a key set of skills they want their managers to have and to use whilst another client has a dedicated resource for this and so there is no need for this subject at this time. Once we have the subject matter finally we agree the delivery method and the internal support available and we’re all set to go. All modules are interactive to maximise on implementation. The following modules are a selection of the subject areas we have designed and delivered for a range of different organisations. They are in no way prescriptive or exhaustive. We can also weave other modules in to your Management Academy that you may be best placed to deliver. For example your HR department may wish to design and deliver something on ‘Employment Law’ or an element of an I.T system that managers need to know. It’s all within a Management Academy toolkit folder which becomes each manager’s ‘go to’ resource. .The in-house Management Academy is not charged per delegate, but as a programme rate. Experience tells us up to 15 managers per programme works as an in-house delivery option. The actual investment depends on the number of modules, the delivery and any additional face to face support. It often works out more cost effective to have a bespoke in-house Management Academy than it is to send 15 managers on our open programme. Please contact us to discuss your specific requirements so we can give you an accurate cost. If you have less than 8 Managers that you want to develop, then maybe our Open (Public) Management Academy programmes is more effective. The added benefit with the public programme option is that your manager(s) will meet other managers from a range of different organisations and sectors sharing, learning and networking. I just wanted to e-mail you with some feeback, I’m just finishing my second year as a manager with Leaders, and as an office we will be £25k over our targeted figure. This is down to many little things that Lewisham, as an office, have been putting into place such as diary planning, directing and leading the branch to forecast levels so profits and cost is achieved. Planning a more structured day for ourselves, resulting in consistency and success enabling us to all face in the right direction. We have been working more effectively as a team and this has contributed into a very successful outcome for the financial year! I had my budget meeting with Kim Evans & Allison Thompson last week and they are very pleased with our year performance. As a manager, I’m constantly referring to my management guide and notes, this has been the perfect aid in my focus, on achieving branch expectations. Many thanks again MPT , it’s been a pleasure.